Posted by Briana Hammontree on April 6, 2019 in Lifestyles, Top Stories. 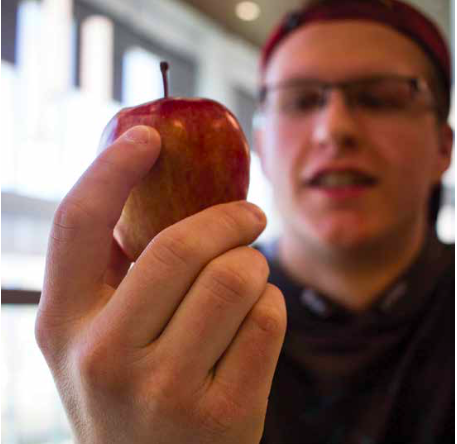 As April appears, March’s ‘National Nutrition Month’ draws to a close, but Ferris general studies freshman Nathan Walker is planning to continue his healthy journey. Walker said. However, within his first semester here at Ferris, Walker admits to finding himself giving into the indulgences of the buffet-settings of both The Rock and The Quad Café on campus. After noticing a shift in his health and after going to the gym with a friend, Walker decided to check out Ferris’ nutritionist office to learn what methods would help him in building his strength back. “I asked a lot of questions I had about dieting, and I explained to her what my goals were and then she explained to me what different foods will do in relation to the exercises done. Like, you could lose weight faster, build muscle quicker and other stuff like that,” Walker said. Ferris’ registered dietitian nutritionist (RDN) is Brenda Walton, whose tasks involve helping students and staff with nutrition questions and concerns, collaborating with dining services and assisting with ‘Wellness Wednesday’ activities. While her services are free for staff and students, Walton says there are some easy tools people can use for a healthier lifestyle including drinking plenty of water, eating three to four meals a day and partaking in simple physical activity such as walking or deliberately using stairs instead of elevators. 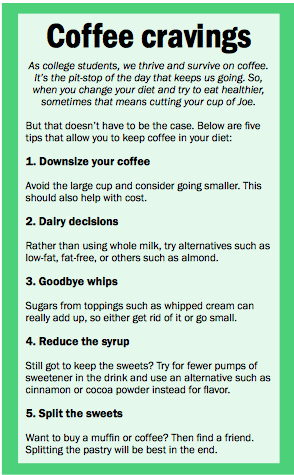 “Keeping a food journal is a good way to monitor what you’re eating or drinking as well – how much or the portion. They can then bring it into me, and I can look it over to see if they are missing certain food groups, and I can give them a place to start,” Walton said. Ferris pre-nursing sophomore Kennedy Melton didn’t realize Ferris offered the resource of a nutritionist, but wouldn’t be opposed to using it in the future given the fact she lives off campus and finds herself eating more fast-food. However, like Walker, Melton credits the use of a support system in helping keep her on track for making healthier decisions, as she is a member of a sorority. “I hang out with a lot of my sisters, and typically they are a lot healthier than me, so just being around them who eat healthily makes me want to eat healthily or stay active, whether that’s doing stuff for classes or volunteering,” Melton said. For more information on meeting with a nutritionist, contact Walton at BrendaWalton@nullferris.edu.